As we just learned, snow is important for global climate because of its role in reflecting solar radiation. But snow and ice are also important because they slow down the escape of heat stored in bodies of water (both oceans and lakes/ponds). Certain characteristics of snow have an important impact on the rate of heat moving from the ground or water into the atmosphere. 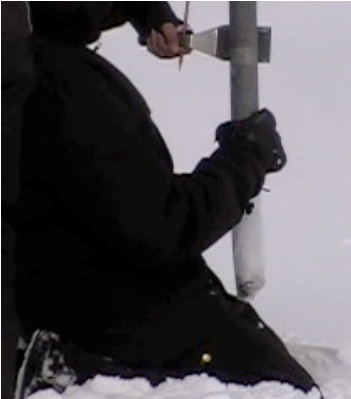 One of the most important properties of snow is its capacity to serve as an insulator. Check Your Thinking: What physical characteristic of snow makes it an effective insulator? To help you understand this, think about what makes goose down an effective insulator. If you want to buy a down coat or sleeping bag that will keep you very warm, you want a down product that has the greatest loft. In other words, you want the fluffiest coat you can get. The fluffier the coat, the more trapped air it has, and the warmer it will keep you. One characteristic of snow that is important in determining its effect as an insulator is the density of the snow. Dense snow, snow that is compacted or wet, loses much of its insulation value because it loses a lot of its trapped air. Scientists study the density of snow to help them understand how rapidly heat can move from the water or the ground into the atmosphere (and into space). Studying the density of snow is something that teachers can do with upper elementary age students. Students have a lot of trouble understanding density because they confuse density with weight. For example, if you ask a child what causes something to sink, they will usually say an object sinks because it is heavy. In order to understand density, students need a lot of practice with measuring density and examining the properties of objects in relationship to density. Download the Buoyancy and Density: Middle School Unit Plan document (pdf) for a series of activities to help students understand density and buoyancy. The basic sinking and floating activities can be carried out with very young children. The mathematical calculations for density can be introduced between fourth and eighth grade. Students need to apply the concept of density over and over again in order to understand the difference between weight and density. Just calculating the mathematical formula for density does not help students understand density. Having them measure the densities of real objects will help them understand the meaning behind the mathematics. 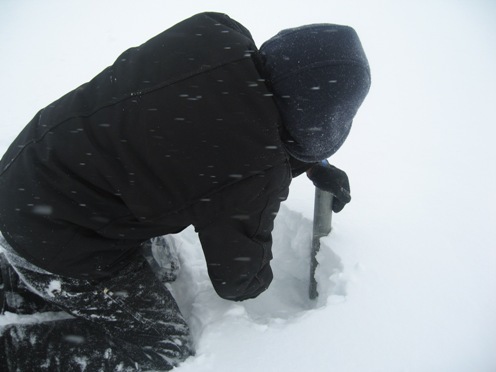 Check Your Thinking: What do you need to measure in order to determine the density of snow? The attached two activities – the Snow Volume, Temperature and Density (pdf) and The Science of Snow (pdf) – engage students in collecting data to calculate the density of snow. They will also gather data on the temperature of the snow. Use the Snow Field Data Sheet (pdf) to record data while outdoors. The data sheet can be used to gather data on snow along a 100 meter transect, with a stake placed every 5 or every 10 meters. Or you can gather data at several different locations (record descriptions of each location). 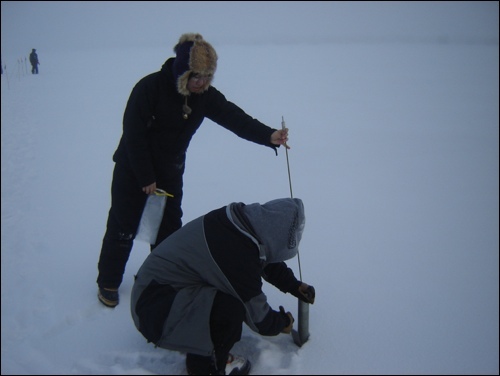 View the photos below that show examples of students and teachers collecting snow samples. 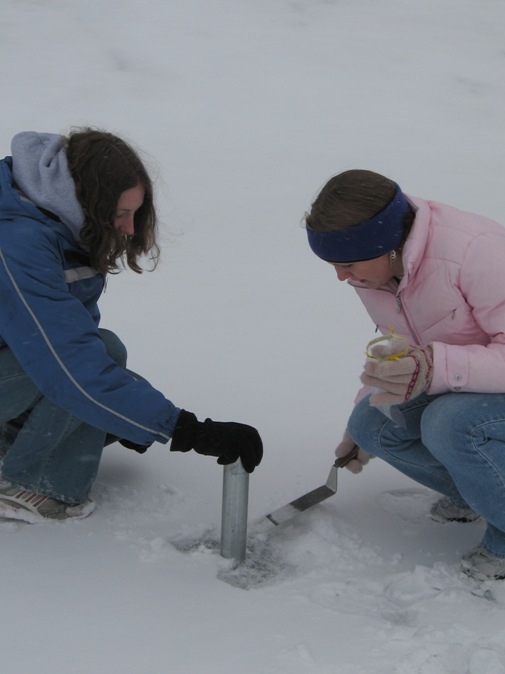 Figure 5.14: Students and teachers collect snow samples. Image from Dr. Delena Norris-Tull. Scientists who study snow have determined that there is a relationship between snow density and the ability of snow to serve as an insulator. The ability of snow to serve as an insulator is described mathematically in terms of the rate at which heat can pass through the snow. The scientific term for this is snow thermal conductivity. The graph below shows the relationship between snow density and snow thermal conductivity. As the density of snow increases, the rate at which heat can move through the snow (snow thermal conductivity) also increases. In other words, dense snow is a poor insulator: heat moves through it rapidly. Fluffy snow is a good insulator: heat moves through it slowly. Figure 5.15: The relationship between snow density and snow thermal conductivity. As the density of snow increases, the rate at which heat can move through the snow (snow thermal conductivity) also increases. Check Your Thinking: Think again about your down coat or sleeping bag. What happens to the insulating properties of that coat or bag if it gets soaking wet? It’s the same with snow: wet snow is much more dense than dry, fluffy snow. Dry, fluffy snow has lots of trapped air. Thus, fluffy snow is a better insulator.